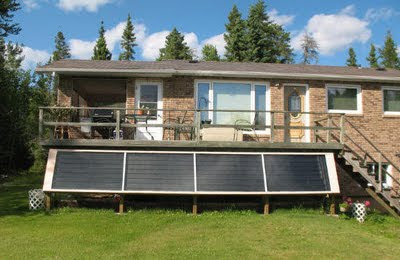 This is a very nice solar water heating system done by Bob and Dave. 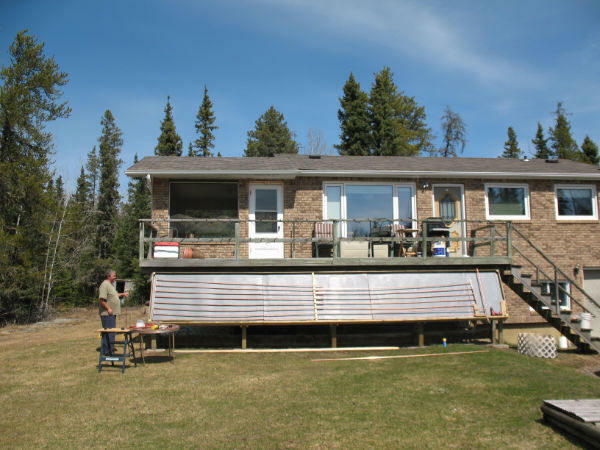 The 24 ft wide collector fits nicely under the deck. Instead of running the collector manifolds horizontally along the top and bottom and connecting the manifolds with many vertical risers with fins, this collector runs the manifolds vertically on the left and right ends. The vertical manifolds are then connected a small number of 24 ft wide "hizers". This saves a lot of fittings, a lot of soldering, and a lot of labor. This is one of the nice things about building a system yourself -- you can adapt the design to your specific situation. The heat storage for the system takes the form of a an insulated vault containing several plastic barrels that store the heated water. 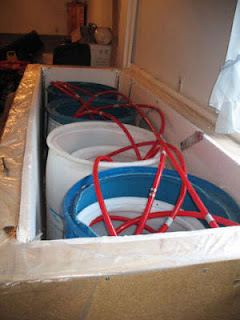 Since the barrels were free, this makes for pretty inexpensive storage. The heat exchangers are pipe coils that are wound inside of smaller drums that fit inside the larger barrels. 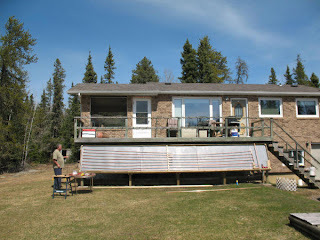 Picture shows the 24 ft "hizers" being laid out. The heat storage vault with the 4 barrels that store heated water. 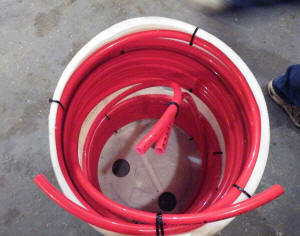 The heat exchanger pipe coils wound inside of smaller drums. 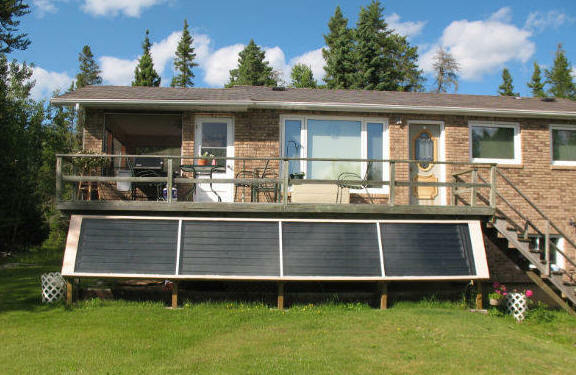 So far, the system is being used primarily for domestic water heating, but the collector design and heat storage scheme certainly make it a good candidate for solar space heating as well. Thanks very much to Bob and Dave for taking the time to document the system!